Called “America’s best-known poltergeist case,” Tennessee’s sensational “Bell Witch” affair of ca. 1817–1821 has gone unexplained, it is said, for two centuries. The demarcation problem is a serious one because science has extraordinary social cachet and commands huge sums of public financing, as well as because pseudoscience maims and even kills people. 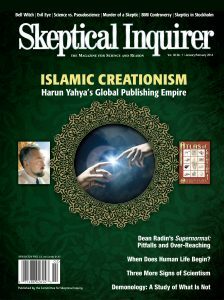 The works published under the name Harun Yahya promote “Islamic creationism.” A closer look at their internal logic reveals that their appeal lies in their capacity to mimic science. Dean Radin’s new book claims that the scientific evidence for supernormal human abilities is now overwhelming. Radin relies upon meta-analyses and misrepresentations of published results to produce outlandish confidence numbers that work against the very belief he is trying to foster. Demonology is one of the most misused terms in English, particularly by those relating the phrase to the occult. But what is it? Extra Time or Game Over?